Flavius Valentinianus Augustus, also known as Valentinian the Great, was Roman emperor from 364 to 375. Upon becoming emperor he made his brother Valens co-emperor, giving him rule of the east while Valentinian retained the west. Valentinian fought successfully against the Alamanni, Quadi, and Sarmatians. His brilliant general Count Theodosius defeated a revolt in Africa and the Great Conspiracy, a coordinated assault on Roman Britain by Picts, Scots, and Saxons. He rebuilt and improved the fortifications along the frontiers, even building fortresses in enemy territory. He is often considered to be the "last great western emperor", and founded the Valentinian Dynasty, with his sons Gratian and Valentinian II succeeding him in the western half of the empire. 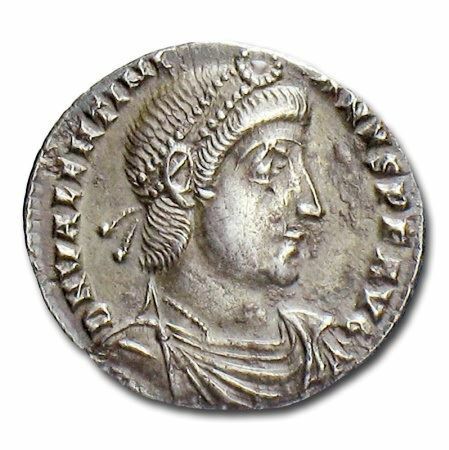 (7) Valentinian I 367-375 A.D.
(8) Valentinian I 367-375 A.D.
(9) Valentinian I 364-375 A.D.